In a large skillet, saute chicken in oil, Sriracha, lime, garlic, ginger, soy sauce, salt & pepper. While chicken is cooking, prepare the linguine (to al dente) and make the peanut sauce. After the chicken is cooked, remove from the skillet and wrap in foil to keep warm. Add more oil to the skillet, add vegetables and saute (except for the bean sprouts, add those a few minutes before serving so they are still nice and crunchy and don't get overcooked). Add the chicken and bean sprouts to the skillet, cover, and reduce heat. Drain noodles and stir them together with the peanut sauce. Top with veggies & chicken and garnish with peanuts and limes. For the peanut sauce: Combine chicken broth, peanut butter, chili sauce, honey, soy sauce, ginger, and garlic in a small saucepan over medium low heat until sauce becomes smooth and well blended. Made it today. We loved it! 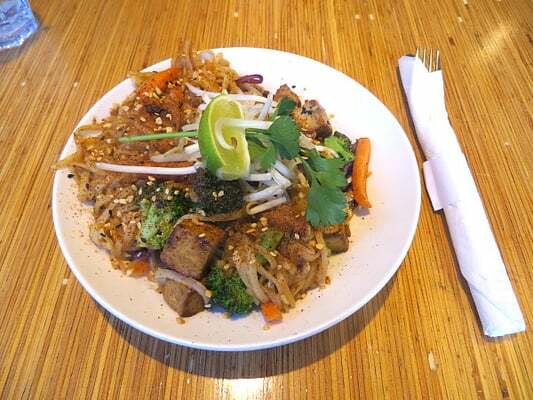 I ate for the first time at noodles and company a few days ago and I have been craving this dish. I made it today at home. Thanks for the recipe tastes just like it.